The Chinese Embassy in Berlin has called on a German company to halt sales of T-shirts which say: “eat a Chinese.” An online petition calling on the company and those selling the shirts to apologize was launched. Spreadshirt, an online retail company, came under fire earlier in March when people noticed T-shirts with dubious messages. 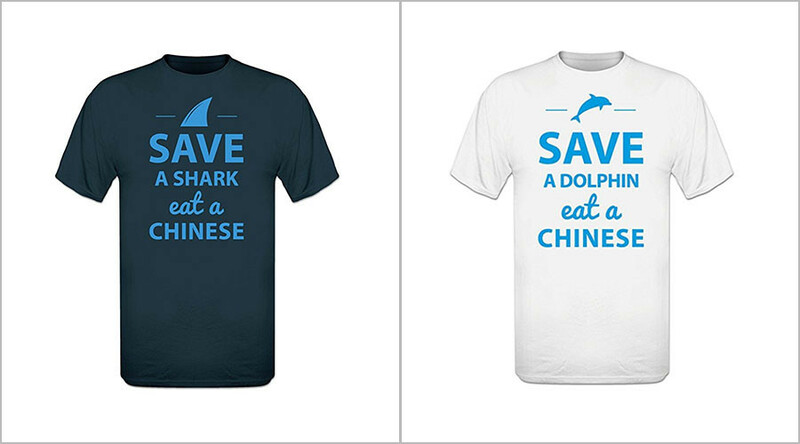 “Save a dog, eat a Chinese” and “Save a shark, eat a Chinese,” said the slogans written on them. The ambiguous slogans were apparently meant to encourage the customers to eat more Chinese food, instead of dogs and sharks. However, the article ‘a’ obscured the meaning, as though they were encouraging people to eat “a Chinese person,” according to angry reactions from people on social media. Dog meat and shark soup are a part of Chinese cuisine, but the consumption of dog is now prohibited in the country. People on social media slammed the T-shirts, calling them racist and terrible. Spreadshirt deleted the T-shirts from the website, thanking its customers for reporting offensive products. “Thank you to those who have reported designs. We will review these individually and take appropriate action,” the company said on Facebook. The controversial T-shirts were not left unnoticed in Chinese diplomatic circles. On Friday, the Chinese Embassy in Berlin expressed “great displeasure” over the controversial products, and asked the company to remove all of the T-shirts with the offensive inscriptions and apologize. “We demand from the German supervisory authorities to exercise their duties with regard to the business activities of the company and the website so that the friendly feelings between our two people will not be damaged,” the statement said. However, the website still has a T-shirt with the dubious slogan: “WHERE MY DOGS AT?” featuring a Chinese takeout container. Other online stores still have the “Eat a Chinese” T-shirts – including Amazon, Zazzle and Shirtcity. Angry customers have launched a petition on change.org, calling for the T-shirts to be removed from these websites. “We ask all these site [sic] to issue a public statement (including Spreadshirt) as an apology to the Asian communities for selling such racist t-shirts. Thus far even though Spreadshirt has removed the shirts, there has not been a public and formal acknowledgement,” it says.